Discription:This is very tasty try it and Enjoy!! Blend together all the ingredients and serve chilled. For health reasons one can omit sugar. Discription:Kashi halwa is one of the famous sweet dish from Southern parts of India. The recipe is made with grated winter melon. Peel the winter melon, remove the seeds, grate, squeeze the water from it and keep it aside. Heat ghee in a heavy bottomed pan and fry the cashew till light brown. Add the raisins and fry till they puff up. Keep it aside. Now add the grated winter melon and saute till all the water evaporates and winter melon is cooked. Add the sugar and mix it well. Keep stirring till all the water evaporates. Add the food color, fried cashew and raisins and crushed cardamom. Mix it well. 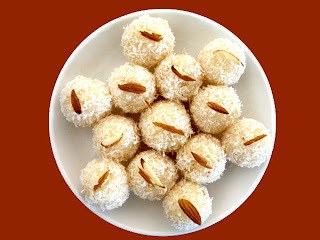 Discription:Coconut ladoo is a melt-in-the-mouth sweet dish, widely popular in the northern states of India. It is a true delight for the taste buds of the people with a sweet tooth. Coconut ladoos, as the name suggests, are balls made out of coconut, which is combined with suji (semolina) and sugar. The basic recipe remains the same, which makes it easy to learn and try. Moreover, it is a simple recipe that doesn't consume much time. While coconut ladoo is generally made by using generous amounts of ghee (clarified butter), you can also ensure a similar taste, by using condensed milk. Dry-roast the semolina in a kadhai or a flat bottomed vessel. As soon as it starts to get slightly brown, take it out and keep it aside. Add one cup grated coconut in the semolina. Keep the rest to wrap the ladoos for later on. Let the mixture cool a bit. Mix the ground sugar after a while. Add 3/4 tin Milkmaid and mix well. Now add all the rest of the ingredients and mix well. Make small balls of the mixture, about the size of a table tennis ball. Roll the ladoo in the dry coconut powder that we kept aside earlier. Keep in refrigerator once done. Serve it with hot puri. 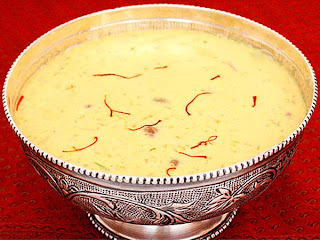 Discription:Kheer is a traditional Indian sweet dish, which is typically made by boiling rice or broken wheat with milk, sugar and flavored with cardamom, saffron etc. Many variations can be brought about to the basic recipe of kheer, which is served as dessert after a sumptuous meal. No matter what the festival is, kheer finds a special place in the menu. It is very simple to prepare and the best recipe to experiment with, for the people, who are fond of cooking. Soak the raisins, currant, peaches, apricots, in hot water for 10 minutes. Boil milk, with cardamom, saffron and sugar for 10 minutes. Drain the soaked dry fruit, add to the boiling milk, and stir gently. Simmer, stirring occasionally, for 5 minutes. Add almonds, pistachios, and take off from fire. Serve hot. Discription:This is tasty ice-cream.Try it and Enjoy!! Place pineapple, cottage cheese, lime juice, and sugar in a food processor and pulse until sugar is dissolved and mixture is smooth. Place mixture in the fridge and chill until cold, about 2 hours. Place mixture in the ice cream maker and churn according to the machine directions. Transfer to a freezer-safe container and freeze for at least 2 hours before serving. 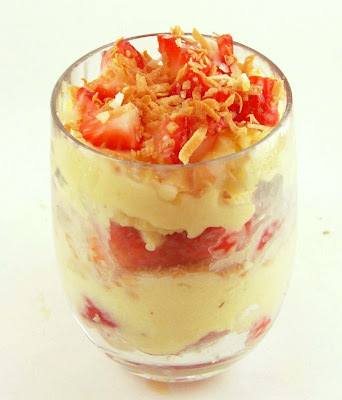 Layer pineapple ice cream with toasted coconut and strawberries to make mini sundaes. Discription:This is very tasty ice-cream.Try it and Enjoy!!! Spoon some ice cream into 1 cone, packing gently to fill. Dip large (1/4 cup) round ice cream scoop into bowl of hot water. Scoop large mounded ball of ice cream onto cone, pressing gently. Stand cone in small glass; place in freezer. Repeat with remaining cones and ice cream, placing each cone in individual glass. Freeze 2 to 8 hours. Place bittersweet chocolate and oil in small glass bowl. Microwave on medium-high until chocolate is melted, stopping occasionally to stir, about 1 1/2 minutes. Let stand just until cool, about 10 minutes. Working quickly and tilting bowl of bittersweet chocolate to form deep pool, dip ice cream end of cone into chocolate, turning to coat. 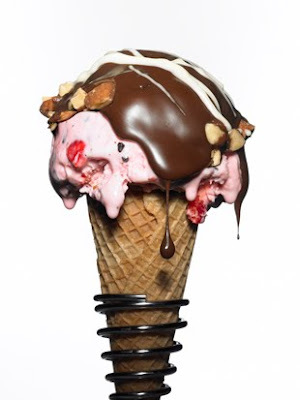 Gently shake cone, allowing excess chocolate to drip back into bowl. Immediately roll bottom half of chocolate-dipped scoop in nuts. Dip fork into white chocolate; drizzle lines over top of cone. Place cone in glass; return to freezer. Repeat with remaining cones. DO AHEAD: Can be made 1 day ahead. Wrap cones in foil; keep frozen. Discription:Making ice cream and sorbet without an ice maker creates a product that goes rock hard with too much freezing.Try it and Enjoy!!!! Pulp/juice mangoes thoroughly, including squeezing off excess pulp from seed with hands. Put pulp/juice into processor and purée. In a pan, add a small amount of mango juice and the sugar. 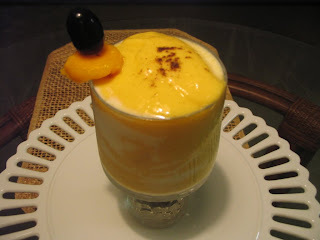 Add sugar mixture to remaining mango pulp in blender and purée again. Add yoghurt and blend until well mixed. Pour mixture into a metal slice tin, cover with plastic wrap and put in freezer. Use metal because it is a better conductor of cold and heat. When almost frozen (about 3 hours), put mixture in processor and blend until smooth. Return to freezer as quickly as possible. Repeat process again when almost frozen (about 2 hours). Repeat process again when almost frozen (about 1hr). Return to freezer for another hour and now it’s ready to eat. Discription:This is very tasty and easy to make.Try it and Enjoy!!! Peel mango and cut into cubes. Using a blender or food processor, turn the mango into a baby food consistency. Add lemongrass pulp and mix well. Pour in the cream and stir until mixed. In a separate large bowl (Great if it has a spout!) beat 4 egg whites until frothy, and then beat in the sugar gradually. Fold in the fruit and cream. Freeze and mix according to your ice cream maker instructions. Discription:This is very tasty ice-cream.Try it and Enjoy!!!! 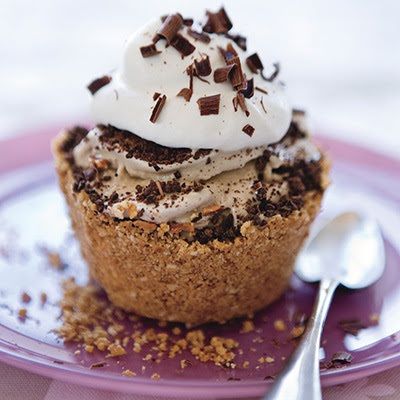 Using a food processor, grind the ice cream cones into fine crumbs. Transfer to a medium bowl and stir in the butter. Divide the crumb mixture among the cups of a 6-cup jumbo muffin pan and press about three-quarters of the way up the sides of each cup. Spoon 1 tablespoon almonds into each cup. In a small, microwaveable bowl, melt 3 ounces chocolate at medium power in intervals, stirring occasionally. Top the almonds with the melted chocolate to cover. Spoon about 2 tablespoons ice cream into each muffin cup. 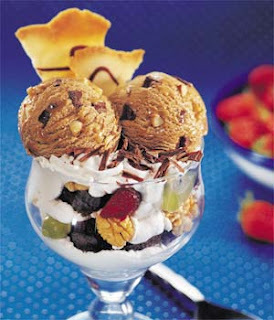 Sprinkle 1 tablespoon chopped espresso beans onto the ice cream and flatten with the back of a spoon. Add another 2 tablespoons ice cream and the remaining almonds and flatten again. Add the remaining ice cream and espresso beans, and flatten. Whip the cream and confectioners’ sugar until soft peaks form. Run a knife around the edges of the muffin cups to remove from the pan. Top the cakes with the whipped cream and chocolate shavings. Sit back, feet up and enjoy! 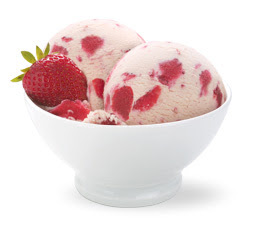 Discription:This is Cool, creamy, and pink.It is Dotted with red strawberriesThis is Tastes like the summer.This is tasty and Enjoy!! Mix all the ingredients together and chill until very cold. Then pour into your ice cream maker’s canister. Churn until thickened, then freeze for a couple hours to firm it up. Pudding mix is an interesting ingredient, but it works — this ice cream is good. Be sure not to overfill your ice cream maker — fill it 3/4 full only to leave room for the ice cream to aerate and grow. Peel the bananas and roughly chop into small chunks. Put in a plastic sandwich bag and seal. Place flat in the freezer and leave for about 2 hours, until they are completely frozen. This can be done days in advance. however, the ice-cream itself can be made at the last minute, just before you serve it. 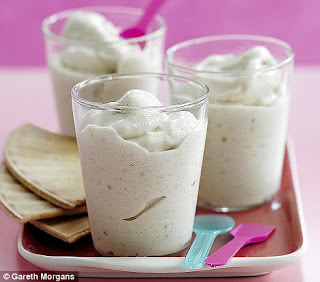 You simply place the frozen bananas in a food processor with the custard, double cream and Manuka honey. Blitz until you have a smooth, creamy ice-cream and serve straight away. If you happen to have any ice-cream left over, it can be frozen and used another day. Pour the milk into a saucepan, add the vanilla pod or extract and gently bring to the boil. Beat together the egg yolks and sugar until they are pale and creamy. Stir in the milk, return the liquid to the saucepan and stir continuously over a low heat until it thickens and just starts to coat the back of your spoon (it should be the consistency of double cream). Make sure you don't boil the custard because it may separate and curdle. if you feel it is getting too hot, remove from the heat and just continue stirring until it thickens. Remove the pan from the heat, take out the vanilla pod, if using (scraping out the seeds first), stir in the cream and leave to cool. 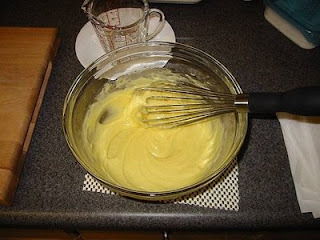 leave the custard base to cool and then pour the mixture into an ice-cream machine and churn for about 20-30 minutes, until the ice cream is thick and scoopable. This is ready to eat straight away, or can be made into a sundae as suggested on these pages, or transferred to the freezer in a covered container. 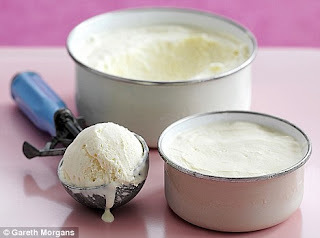 If you don't have an ice-cream machine, place the mixture in a container (ideally metal) and freeze, beating well at 1 hour intervals, until scoopable. Discription:This is very tasty.Try it and Enjoy!! To make the ice-cream, follow the instructions for the vanilla ice-cream given left, until the stage at which it is ready to churn. If you are using fresh berries, remove any stalks and rinse under the tap. Frozen ones just need to be defrosted before using. Puree the berries and sugar in a food processor or blender, or mash well with a potato masher. Push the puree through a sieve to remove any pips or seeds. Taste the puree and add more sugar if it isn't sweet enough. 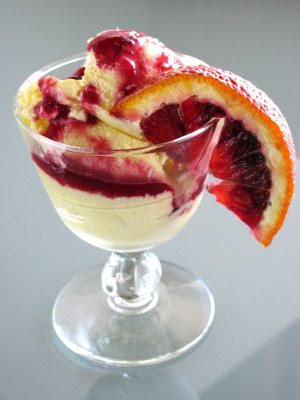 Add the puree fruit to the vanilla custard and pour into an ice-cream machine and churn for about 20-30 minutes, until the icecream is thick and scoopable. To make the sauce, blend together the raspberries, lemon and sugar until smooth and then push through a sieve. 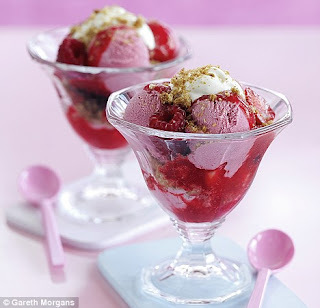 now layer the ice-cream, raspberry sauce, some fresh berries, whipped cream and crumbled biscuits in a sundae glass. 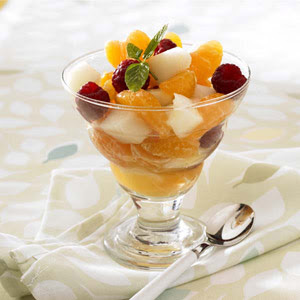 Discription:This refreshing and very healthy fruit salad is stunningly colourful, perfect for any party table, and very quick to prepare. Squeeze the juice of one Satsuma into a mixing bowl. Peel the other two, divide into segments and add to the bowl of juice. Chop the melon and add to the bowl along with all the raspberries. Stir in the liqueur and add a little sugar to taste. Discription:An American innovation.......this flavour gets its name from the crunchy almonds and walnuts and chewy marshmallows that add a deliciously unusual element to the otherwise smooth texture of ice-cream. Bring out your largest serving spoon.......your little devils are sure to ask for large helpings of this "bumpy" creation. Combine the chocolate and condensed milk in a pan and melt over a slow flame till the chocolate melts completely. Allow it to cool slightly, add water and mix well. Cool completely. Add the cream and vanilla essence and mix again. Blend this mixture in a blender if necessary, to ensure that it is smooth. Pour into a shallow container and cover and freeze till it is almost set. Divide the mixture into 2 parts and churn each portion in a blender. Add the walnuts, almonds, chocolate chips and marshmallows and gently stir them in. Transfer into a shallow container, cover and freeze till it is set. Scoop and serve. Discription:Most people prefer to buy mayonnaise from store rather than making it at home. Mayonnaise is prepared in different ways. Some make it with whole egg while others only use egg whites and same is the case in this mayonnaise recipe . You can make either type but the method remains the same. By using this mayo you can easily prepare different flavors of mayo like mayo garlic is prepared by adding just garlic powder to it. Beat egg yolk and mustard paste to make a smooth paste. Slowly add oil in it and blend the mixture in the blender. Now put some seasoning in it; salt and sugar, vinegar and white pepper if you want. Discription:Brown sauce is often called bbq sauce. This is original brown sauce recipe in which onion is used while in original barbecue sauce little amount of carom is used to give bbq like smell. 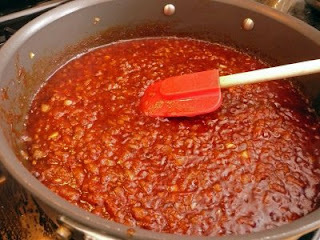 This is very popular sauce which is available at every restaurant and served with many fried food items. It is one of the very simple and easy sauces to make. Heat oil in a frying pan and fry onion to make it soft for just 1-2 minutes. Now add rest of the ingredients one by one including tomato paste, brown sugar, vinegar, pepper, Worcestershire sauce and salt. Mix all the ingredients together and cook on medium flame for 5-8 mins. When oil starts bubbling, switch of the flame and take out the sauce in a bowl and let it cool at room temperature.